Buying your first cello – whether for your child or yourself – is a tricky business. Twenty years ago the problem was the distinct lack of choice in the budget price range. Nowadays there are more budget cello brands than you can shake a stick at, each claiming to sound like an instrument worth a great deal more than its retail price. Add to this the fact that the average buyer’s concept of budget prices varies a great deal and the price of a single brand and model can vary by as much as £150 and you’ve entered a minefield. After years of assisting my beginner students with the purchase of their first instrument, I have some valuable advice to share with players, parents and teachers. 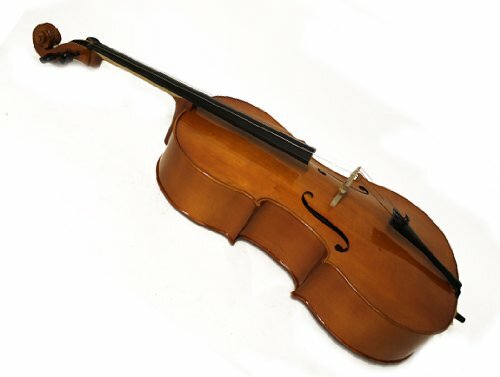 If you have a set budget for buying a cello you might be surprised (and annoyed) to find out that the cost rarely ends with the purchase of the instrument. I’m not talking about long-term costs such as string replacements, instrument maintenance and bow re-hairs either. The reason basic student instruments cost so little is generally because they cost very little to make. This means that corners are cut and production values leave much to be desired. I have never seen a brand new instrument in the lowest price range (up to £400) that didn’t need several crucial adjustments to get it into a playable state, often costing more than the instrument itself. To illustrate this point, here’s a case study of one of my students, who bought herself a cello before looking for a teacher. She had wanted to take cello lessons for years, and had sensibly waited until her job allowed her the financial and time flexibility before buying an instrument and committing to lessons. Given how long she had waited for this opportunity and how much she wanted it, she knew it was more than a passing fancy and decided that she might as well buy a cello rather than rent one. She was pleasantly surprised when she went online to find out how little she could have her very own cello for. What was more, delivery was guaranteed the day after she paid for it, and only cost an additional £5. That was settled then: she had found a cello advertised as “perfect for beginner to advanced players” which came with a “reliable brazilwood bow” and a lightweight hard case apparently worth considerably more when sold as a separate unit – all for an amazing £175. Her cello arrived the following day as promised, but she was a little taken aback when she opened the case for the first time: it didn’t look much like any cello she had ever seen because the instrument was shipped with the bridge flat and the retailers had failed to inform her at any time during her transaction that they were going to do this. Well, it was a very reasonable price after all, so she didn’t rush to the phone to complain about it. Instead she rummaged through the packaging to see whether any instructions had been included for getting the cello into a playable state. Sure enough, she found a single sheet explaining that the cello was shipped this way to prevent damage and assuring her that setting up the bridge was a very simple matter of aligning the feet with the nicks in the F holes and tightening the strings using the tuning pegs until there was sufficient pressure to keep it in place. Things only went downhill from there. She stood the bridge up and began attempting to tighten the strings as directed. This was far from easy: the pegs kept slipping and the bridge wouldn’t stay put. Eventually she managed to tighten two out of the four strings enough to keep the bridge in place, but it was now far from aligned with the nicks in the F holes. When she tried tuning the third string, it snapped and one of the tightened strings unravelled as the peg jumped out again. The bridge collapsed leaving a fairly large scratch on the cello. At this point she decided that this was clearly not a job for a novice regardless of how easy the instructions insisted it was. When she rang me up to discuss lessons she told me all about her flat-pack cello and my heart sank: I was familiar with the brand and she was not the first of my students to make this nightmarish purchase. I advised her to bring the cello to me as soon as possible so that I could have a look and see whether it could be set up or sent back to the retailer. By the time she brought it to me the soundpost had fallen and the instrument was so far from playable I suggested that she send it back and get a refund or replacement. We called the shop then and there, but were told that since she had already set it up and damaged it in the process the money-back guarantee was now void. Despite a heated conversation between me and various employees there was no persuading them to offer even a reduced refund. So, another £200 later she had spent a total of £375 on a laminated wood (i.e. plywood) cello with a resale value of no more than 60% of the original purchase price. Given the cello’s serious limitations she would most likely be considering an upgrade within three years. She also found herself needing a better bow after only six months of lessons. The bow included in the outfit was best described as disposable: it shed its hair at a staggering rate and looked more like a weapon when tightened. Add another £150 to the bill. At least the new bow would be suitable for a lot longer than the cello. Had she known this could happen, she would have rented a cello after all, or bought a much better quality cello to begin with. § Do your research and ask for professional opinions from cello teachers on whichever brand you’re thinking of buying. The same applies to any other online seller or music superstore. § Do not let yourself be persuaded to set up a cello yourself no matter how easy the salesperson or website tells you it is. It really is a job for a professional and is most likely to lead to a damaged instrument when attempted by an amateur. § Smaller specialist stringed instrument retailers tend to be more expensive, but also offer the benefit of a workshop and trained in-house luthier who will set the instrument up to the buyer’s specifications. A beginner will not have any idea of how they wish their instrument to be set up, but a teacher, professional player or advanced amateur will be able to make informed recommendations. § If the instrument is in the lowest price bracket, check to see who else stocks it. Beware of bargain basement outlets whose emphasis is on their incredibly low prices rather than their expertise in the field of musical instruments (which is normally non-existent). These sellers simply import the very cheapest instruments China has to offer which reputable resellers won’t touch. From my experience, it is cellos in the mid price range that are the most dependable. They all require a few minor tweaks, but nothing like the catalogue of errors that come with the cheapest cellos. Then we have the “deluxe” models: always considerably more expensive than the mid range, generally more impressive to look at, but all too often no better in genuine quality than the mid range. Makers have tricks to make average instruments appear superior: the most common one being artificially created flame. In case you’re wondering, flame is the pattern found in maple, the wood used for the back and sides of stringed instruments. The better quality the maple, the more densely flames the back and sides will be. However, flame can be created with varnish, making plain wood look spectacular to the untrained eye. Other tricks include adding shiny bells and whistles to the pegs, end button and spike to make the cello look posh. These additions make no difference whatsoever to the quality or value of the instrument and often drive the price up exponentially. This is not true of all student instruments in the upper price range, so if you’re considering splashing out on a good cello be sure to have an advisor other than the salesperson on hand. So there it is: the veritable minefield that is cello buying. These are the main points to remember: do your research, get advice from a professional, and beware of being a fool for a bargain. If it sounds too good to be true, it probably is!